Every self-respecting phone company needs a phablet in its ranks, not to mention a few tablets, and that's exactly what Alcatel has launched at CES 2014. 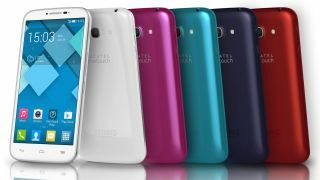 First up is the 5.5-inch Alcatel One Touch Pop C9, a phablet which offers up a qHD display, 1.3GHz quad-core processor, 8MP rear camera, 2MP front snapper, Android 4.2, 1GB of RAM and 4GB of internal storages. Looking at those specs the Pop C9 won't be challenging the likes of the Galaxy Note 3 or Xperia Z Ultra at the high-end of the phablet market, rather it'll be playing ball with the likes of the Nokia Lumia 625 and Samsung Galaxy Grand 2. The Pop C9 smartphone has been joined by two tablets which also bear the playful "Pop" branding - the Pop 7 and Pop 8. For those of you who are a little slow off the mark these are 7-inch and 8-inch tablets respectively, with the former packing a 1.3GHz dual-core processor, 2MP rear camera and VGA front facing lens. The larger 8-inch model features a 1280 x 800 IPS display, 1.3GHz quad-core processor and the same camera set up as the Pop 7. There's no news on release dates or prices for any of these products, but going by their mediocre spec lists and range of kid-friendly colours we expect all three to carry affordable price tags.